.5 Creedmoor 120 grain Barnes TTSX (lead free)~ The 6.5mm Creedmoor, is a centerfire rifle cartridge introduced in 2007 as a modification of the .30 TC, which was based on the .308 Winchester. It was designed specifically for long-range target shooting, although it is also achieving success in game hunting. Bullet for bullet, the 6.5mm Creedmoor achieves a slower muzzle velocity than longer cartridges such as the 6.5-284 Norma or magnum cartridges such as the 6.5mm Remington Magnum. However, due to its 2.825 inches (71.8 mm) overall length, it is capable of being chambered in short-action bolt-action rifles and AR-10 semi-automatic rifles. Long-range shooter Ray “RayDog” Sanchez summarized the bolt-action Tubb 2000 rifle in 6.5mm Creedmoor as “boringly accurate” at 1,000 yards (910 m). He asserted the rifle and ammunition combination he used was able to maintain sub-MOA groups at 1000 yards. Our 100% Hand-Loaded LEAD FREE 120 grain Barnes TTSX rounds are loaded with extremely tight tolerances, producing highly accurate, consistent and reliable performance with each and every shot! Our proprietary load formulas and loading process create the finest round of ammunition available on the commercial market today we feel. If you don’t load your own ammunition- let us do it for you! 6.5 Creedmoor 120 grain Lead Free Hornady GMX~ The 6.5mm Creedmoor, is a centerfire rifle cartridge introduced in 2007 as a modification of the .30 TC, which was based on the .308 Winchester. It was designed specifically for long-range target shooting, although it is also achieving success in game hunting. Bullet for bullet, the 6.5mm Creedmoor achieves a slower muzzle velocity than longer cartridges such as the 6.5-284 Norma or magnum cartridges such as the 6.5mm Remington Magnum. However, due to its 2.825 inches (71.8 mm) overall length, it is capable of being chambered in short-action bolt-action rifles and AR-10 semi-automatic rifles. Our 100% Hand-Loaded LEAD FREE 120 grain Hornady GMX rounds are loaded with extremely tight tolerances, producing highly accurate, consistent and reliable performance with each and every shot! Our proprietary load formulas and loading process create the finest round of ammunition available on the commercial market today we feel. If you don’t load your own ammunition- let us do it for you! Hard-hitting and deep-penetrating, the GMX bullet combines monolithic construction with pioneering ballistic design to meet the need for a premium, non-traditional bullet. Tougher than pure copper, the mono-metal copper alloy has been proven to shoot cleaner, foul less, and deliver consistent, even pressure curves. The tough alloy material routinely retains 95% or more of its original weight and expands up to 1.5 times its original diameter. 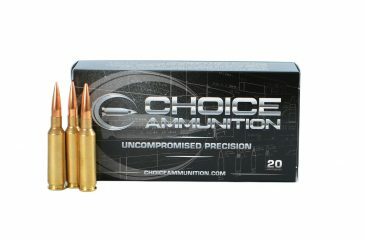 Fully California compatible and appropriate for use in areas requiring the use of non-traditional bullets. 6.5 Creedmoor 123 grain Lapua Scenar~ The 6.5mm Creedmoor, is a centerfire rifle cartridge introduced in 2007 as a modification of the .30 TC, which was based on the .308 Winchester. It was designed specifically for long-range target shooting, although it is also achieving success in game hunting. Bullet for bullet, the 6.5mm Creedmoor achieves a slower muzzle velocity than longer cartridges such as the 6.5-284 Norma or magnum cartridges such as the 6.5mm Remington Magnum. However, due to its 2.825 inches (71.8 mm) overall length, it is capable of being chambered in short-action bolt-action rifles and AR-10 semi-automatic rifles. Choice Ammunition has taken our 100% hand-loading techniques and produce an extremely accurate, highly dependable round for the 6.5 Creedmoor in this load. Our loading tolerances are only matched by passionate hand-loaders in their own loading rooms. 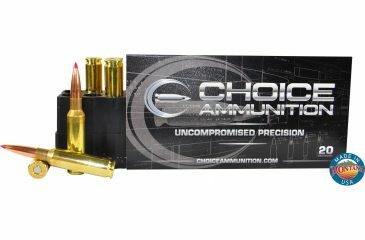 Consistent seating depths, powder charges and proprietary formulas of Choice Ammunition, make this 123 grain Lapua Scenar round the best you can buy on the commercial market today. We are offering more bullet selections in the near future for this caliber. 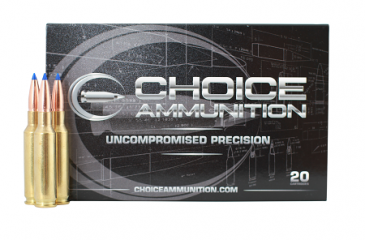 6.5 Creedmoor 123 grain Nosler Custom Competition~ The 6.5mm Creedmoor, is a centerfire rifle cartridge introduced in 2007 as a modification of the .30 TC, which was based on the .308 Winchester. It was designed specifically for long-range target shooting, although it is also achieving success in game hunting. Bullet for bullet, the 6.5mm Creedmoor achieves a slower muzzle velocity than longer cartridges such as the 6.5-284 Norma or magnum cartridges such as the 6.5mm Remington Magnum. However, due to its 2.825 inches (71.8 mm) overall length, it is capable of being chambered in short-action bolt-action rifles and AR-10 semi-automatic rifles. Long-range shooter Ray “RayDog” Sanchez summarized the bolt-action Tubb 2000 rifle in 6.5mm Creedmoor as “boringly accurate” at 1,000 yards. He asserted the rifle and ammunition combination he used was able to maintain sub-MOA groups at 1000 yards. Choice Ammunition has taken our 100% hand-loading techniques and produce an extremely accurate, highly dependable round for the 6.5 Creedmoor in this load. Our loading tolerances are only matched by passionate hand-loaders in their own loading rooms. 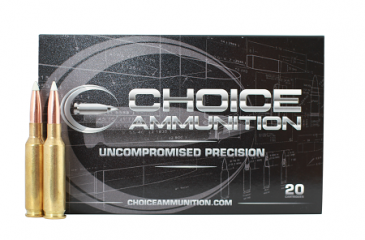 Consistent seating depths, powder charges and proprietary formulas of Choice Ammunition, make this 123 grain Nosler Custom Competition round the best you can buy on the commercial market today. 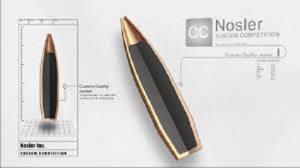 Try a box of our 6.5 Creedmoor in the Nosler Custom Competition bullets today and experience the new match standard. 6.5 Creedmoor 130 Grain Nosler AccuBond~ The 6.5mm Creedmoor, is a centerfire rifle cartridge introduced in 2007 as a modification of the .30 TC, which was based on the .308 Winchester. It was designed specifically for long-range target shooting, although it is also achieving success in game hunting. Bullet for bullet, the 6.5mm Creedmoor achieves a slower muzzle velocity than longer cartridges such as the 6.5-284 Norma or magnum cartridges such as the 6.5mm Remington Magnum. However, due to its 2.825 inches (71.8 mm) overall length, it is capable of being chambered in short-action bolt-action rifles and AR-10 semi-automatic rifles. Our 100% Hand-Loaded Nosler AccuBond rounds are loaded with extremely tight tolerances, producing highly accurate, consistent and reliable performance with each and every shot! Our proprietary load formulas and loading process create the finest round of ammunition available on the commercial market today we feel. If you don’t load your own ammunition- let us do it for you! 6.5 Creedmoor 140 Grain Nosler AccuBond~ The 6.5mm Creedmoor, is a centerfire rifle cartridge introduced in 2007 as a modification of the .30 TC, which was based on the .308 Winchester. It was designed specifically for long-range target shooting, although it is also achieving success in game hunting. Bullet for bullet, the 6.5mm Creedmoor achieves a slower muzzle velocity than longer cartridges such as the 6.5-284 Norma or magnum cartridges such as the 6.5mm Remington Magnum. However, due to its 2.825 inches (71.8 mm) overall length, it is capable of being chambered in short-action bolt-action rifles and AR-10 semi-automatic rifles. 6.5 Creedmoor 143 Hornady ELD-X~ The 6.5mm Creedmoor, designated 6.5 Creedmoor by SAAMI, is a centerfire rifle cartridge introduced in 2007 as a modification of the .30 TC, which was based on the .308 Winchester. It was designed specifically for long-range target shooting, although it is also achieving success in game hunting. Bullet for bullet, the 6.5mm Creedmoor achieves a slower muzzle velocity than longer cartridges such as the 6.5-284 Norma or magnum cartridges such as the 6.5mm Remington Magnum. However, due to its 2.825 inches (71.8 mm) overall length, it is capable of being chambered in short-action bolt-action rifles and AR-10 semi-automatic rifles. 6.5 Creedmoor 130 Grain Berger VLD-Hunting~ The 6.5mm Creedmoor, designated 6.5 Creedmoor by SAAMI, is a centerfire rifle cartridge introduced in 2007 as a modification of the .30 TC, which was based on the .308 Winchester. It was designed specifically for long-range target shooting, although it is also achieving success in game hunting. Bullet for bullet, the 6.5mm Creedmoor achieves a slower muzzle velocity than longer cartridges such as the 6.5-284 Norma or magnum cartridges such as the 6.5mm Remington Magnum. However, due to its 2.825 inches (71.8 mm) overall length, it is capable of being chambered in short-action bolt-action rifles and AR-10 semi-automatic rifles. 6.5 Creedmoor 140 Grain Berger VLD-Hunting~ The 6.5mm Creedmoor, designated 6.5 Creedmoor by SAAMI, is a centerfire rifle cartridge introduced in 2007 as a modification of the .30 TC, which was based on the .308 Winchester. It was designed specifically for long-range target shooting, although it is also achieving success in game hunting. Bullet for bullet, the 6.5mm Creedmoor achieves a slower muzzle velocity than longer cartridges such as the 6.5-284 Norma or magnum cartridges such as the 6.5mm Remington Magnum. However, due to its 2.825 inches (71.8 mm) overall length, it is capable of being chambered in short-action bolt-action rifles and AR-10 semi-automatic rifles.